Football for all at Bushfield on July 15. 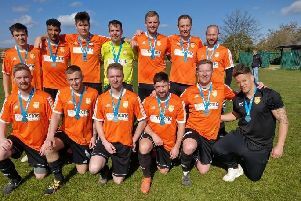 Time is running out for teams wishing to take part in the big bumper festival of football being organised by the Peterborough Football Association as part of their 125th anniversary celebrations. The Family Footballing Fun Day, which is supported by Hunts FA and Northants FA, is on Saturday July 15 at Bushfield Leisure Centre (courtesy of Vivacity) and there is something for everyone. A whole range of activities for individuals, able-bodied and disabled, will be running non-stop throughout the day and they include penalty shoot-outs, skills tests, speed tests, goalkeeper coaching, how hard you can kick a ball, a Peterborough FA trophy exhibition, seminars on how to raise funds for your club and an insight into physiotherapy. And it’s for the young and old with a mini-tots fun session for five and six year-olds and walking football for those whose knees have gone! Team entry fees range from £7 to £15 while for just £1.25 an ‘all activities wrist-band’ will allow wearers to have a go at everything. Walking football for the not so young. The fun day is the first of 12 events organised by the hard-working 125 Committee. Others to come include special commemorative matches, a museum exhibition and a gala dinner.